Keeper's Cottage is located in the peaceful backwaters of Prestwood, with dramatic views of the Weaver Hills. This 18th-century cottage has been renovated in a way that attempts to avoid the pitfalls affecting most conversions. The only noise you are likely to encounter is from the local sheep or our small herd of Irish Moile cattle (Britain rarest breed) which you will find in the field next to the large garden. Put simply, if relaxation is your aim, then Keeper's Cottage is ideal. Ground-floor accommodation includes entrance hall, kitchen, living room, an oak-paneled bedroom with four-poster bed and adjacent shower/W.C room. The cottage, while retaining its original old-world charm, is fitted with a range of modern appliances such as one would expect in accommodation of this quality. The landscaped garden, with its patio, offers space purely for relaxing or for barbeques. Parking is right outside, at the end of a private drive to the property. Please note, a car is essential due to the isolated location of the property. 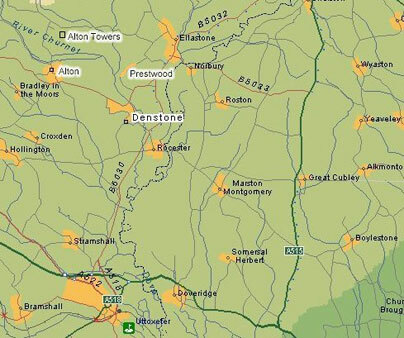 Village shops are available in Ellastone and Denstone, both one mile away, and Rocester village has a newsagent and a small late-opening supermarket. The market town of Ashbourne is six miles away and has a range of quality outlets and many antique shops, some of which we are personally involved with. 9 minutes north of Uttoxeter. From Uttoxeter, B5030 for Rocester and Alton Towers. By JCB factory, turn left onto the B5031. At the T-junction after the church in Denstone, turn right onto the B5032 and over the bridge. Then take first left sign-posted to Prestwood. Manor House Farm is 3/4 mile along a single-track road and on the right through a large brick archway.